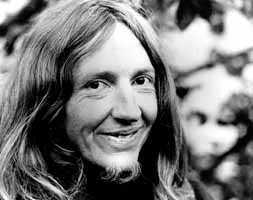 Daevid Allen is one of the most intruiging musicians to emerge from Australia in the late 20th century. Although most of his musical work has been in Britain and France, his career is certainly more than worthy of consideration in the context of MILESAGO. Despite international recognition and an enduring cult following around the world, with David Bowie listing him as one of his all-time favourite artists, Daevid Allen has -- in the words of journalist Richard Guilliatt -- been "singularly and comprehensively ignored in the country of his birth". He is not even mentioned in When London Calls (Stephen Alomes' excellent study of the Aussie artistic exodus to the UK) but there is no question that, like Richard Neville and Martin Sharp, Daevid is one of the many expatriate Australians who have exerted a significant influence on the direction of international music and popular culture. In Daevid's case, this influence was principally felt through his involvement in the early career of pioneering British psychedelic rock groupSoft Machine, and then through his leadegsubip of the cult '70s 'space-rock' band Gong. Although he has been derided as a "hippie", Daevid is no slacker -- he is an impressively productive artist who has created or contributed to literally dozens of major recordings during his career. The list includes around twenty solo Albums (and various solo Singles) between 1970 and the present, plus a dozen more Albums and various Singles recorded with Soft Machine and the various permuatations of Gong, as well as many other collaborations, all of which bear the inimitable stamp of his engagingly eccentric personality and decidedly alternative worldview. Among his many other accomplishments, he has been a friend and jamming partner of Jimi Hendrix and Pink Floyd, he performed poetry with William S. Burroughs, and he has published several volumes of poetry and an idiosyncratic memoir of the psychedelic era, Gong Dreaming. Although some will undoubtedly view Allen's artistic output as fanciful or downright silly, there are strong artistic principles underlying his work and his life, and he was one of the pioneers of the use of chance elements, random operations and free improvisation in rock music. Like the much-maligned trans-Tasman freelance wizard Ian Channel, Allen has unswervingly dedicated his life to his art, and at 65 he is still pursuing his dream while his detractors are slipping into the comfort of a cosy middle-class retirement. Daevid's career has been greatly facilitated by the enduring support of his lifelong creative partner, Gilli Smyth (the mother of his two sons Orlando and Taliesyn) and by his other two life-partners, including British-born Maggie Brown, with whom he has maintained an on-again, off-again relationship since they met in Ibiza in 1977, and who now lives on the NSW north coast. Born in Melbourne on 13 January 1938, Daevid gained early experience in the perforng arts as a child actor on radio station 3DB. After leaving school he trained (rather appropriately, in light of his later psychic explorations) as an interior decorator, and it was at this time that he first met David Tolley. Daevid attended the National Art Gallery School whilst studying electric guitar with renowned Melbourne jazz musician Bruce Clark, and he acted in a review at the Now Theatre in Flinders St. He then joined the fledgling ABC-TV as a scene-painter and trained as a TV graphics artist and studio floor assistant. "He's 65 but he lives the sort of existence that most 25- or 35-year-olds would find tiring. I think his desire to be the iconoclast, to be the anarchist, springs from having grown up in Australia in the '40s and '50s. That just irrevocably marked him." "It was a revelation, because it changed a lot of my attitudes to music and writing, to myself, to a lot of things It was a really important moment, actually. Suddenly I was walking a couple of inches above the ground and seeing multiple facets of myself ... and when I finally got some pure Owsely acid, I had some amazing visions. World-shattering, extraordinary visions -- which I probably would have had if I'd never discovered acid, but it wouldn't have been quite as colourful. Mescaline, STP ... all of these things were were very important to me in terms of my creativity and my art." The other crucial event that took place in Paris in 1962 was his meeting with Robert Wyatt, an aspiring young (14 year-old!) British jazz drummer and singer who like Daevid had recently dropped out of art school and was bumming around Europe. They were soon joined by Hugh Hopper, Wyatt's close friend, who was reportedly much enamored of Daevid's experiments with tape loops, a technique he had had picked up from another Paris contact, avant-garde composer Terry Riley. In 1963 Allen moved to the UK, where he fell in with the clique of aspiring Beatniks and jazzers that included Wyatt, the Hopper brothers Hugh and Brian, Kevin Ayers, David and Richard Sinclair (who were cousins), Richard Coughlan, Pye Hastings and Mike Ratledge. Headquartered in a rambling Georgian house in Canterbury owned by Wyatt's broadcaster mother Honor, the group spent many hours "listening to modern jazz and being exposed to the world of Beat poetry and Dadaist art". This grouping became the nucleus for several very important British bands (now usually known collectively as "The Canterbury Scene") including Soft Machine, Gong, Matching Mole, Camel, Caravan and Hatfield & The North. From this group of friends and fellow travellers, the seminal band Wilde Flowers formed in Canterbury in June 1963; the original lineup was Wyatt (drums), Brian Hopper (guitar, sax), Richard Sinclair (rhythm guitar) and Kevin Ayers (vocals). The lineup changed regularly over the next couple of years with David Sinclair, Hastings and Coughlan all participating at various stages. The band's early leanings were reportedly more towards 'straight' jazz but apparently Daevid's arrival on the scene pushed towards more experimental pop, jazz, avant-garde music and free improvisation. In late 1965 Daevid and Kevin Ayers escaped the English winter and took an extended holiday in Ibiza, Spain. At this time, before the death of fascist dictator General Franco and the subsequent influx of British package tourists, the picturesque island was still largely unspoiled, a secret sunny hideaway favoured by young bohemians from Europe and the USA. During their sojourn in Ibiza, Daevid and Kevin were introduced to a wealthy young American music fan, Wes Brunson, who was heir to a considerable fortune. He encouraged them to form a "serious" group and reportedly "lavished sums of money on them in the process". An especially vivid acid trip in Easer 1966 inspired Daevid to form a new band, and around this time he also coneived the notion that alien intelligences were guiding him, a conviction that formed the basis of his work with Gong and which has remained with him. In early autumn 1966 Daevid and Kevin headed back to England and with Wyatt, Ratledge and (briefly) guitarist Larry Nolan, they formed the new group, while Hastings, Coughlan and the Sinclairs continuing as Wilde Flowers, which was later renamedCaravan. The new band worked under various names before deciding on "Soft Machine", and Daevid's aquaintance with William S. Burroughs enabled him to phone the author in Paris and get his permission. Soft Machine quickly became one of the leading bands of the burgeoning British underground scene, performing with pioneering groups including Pink Floyd, The Crazy World of Arthur Brown, Tomorrow and Dantalaion's Chariot. From late 1966 they were regulars at the newly opened UFO Club in Tottenham Court Rd, and their legendary performances there led to the offer of a one-off deal by the Polydor label. The resulting single, "Love Makes Sweet Music" b/w "Feelin' Reelin' Squealin'", was released on Polydor in February 1967. Besides Daevid's involvement, the single is especially notable for two other reasons -- it was produced by flamboyant West Coast impresario Kim Fowley and the rhyhtm guitar was played by Jimi Hendrix, who was recording his debut single "Hey Joe" at the same studio. "Love Makes Sweet Music" (which was later covered by Australian pop band The Valentines) reached #28 on the Top 40 of pirate radio station Radio London -- but it was certainly not a Top 5 hit, as Richard Guilliatt's article suggests and made no impression on the official BBC charts (there being no commercial radio stations in the UK at that time). As a result, Polydor declined to take up its option for further recordings, so Soft Machine spent April 1967 working on demo recordings with producer Giorgio Gomelsky, but nothing substantial emerged from this (although a fragment of one song from these sessions did pop up in one of the songs on Kevin Ayers' brilliant 1970 solo album Joy of a Toy). On 29 April Soft Machine performed at the fabled "14-Hour Technicolour Dream", the all-night event at London's Alexandra Palace (admission £1) which ushered in the "Summer of Love". Attended by a host of hip identites including John Lennon, the lineup featured a host of stellar acts including Yoko Ono, Alexis Korner, The Pretty Things, Champion Jack Dupree, Graham Bond, Savoy Brown, The Crazy World of Arthur Brown, The Creation, The Move and Pink Floyd (who played at dawn). Newsreel film of the Technicolour Dream survives and excerpts have been included in recent documentaries about Syd Barrett and the early days of Pink Floyd, although it is unknown whether there is any footage of Soft Machine. Shortly after the Technicolour Dream, Soft Machine went to France for a series of concerts which reputedly laid the foundation for their strong following in France. A concert at the Palais Des Sports ended with tear gas being fired into the crowd by police, and in St Tropez they participated in a "total environment" event, part of Alan Zion's production of the Picasso play Desire Atrappe Par La Queue, an experimental multimedia 'hapenning' that was apparently so provocative that it was shut down by the local gendarmes. Daevid's tenure with Soft Machine ended abruptly on their return to England -- he had neglected to renew his British residency papers and was denied re-entry because his visa had expired. The Customs officer on duty reportedly also thought Daevid was "unusually dressed" (which was probably a major understatement) but this was evidently sufficient cause for him to be detained and searched. With Daevid summarily removed from the group, Soft Machine soldiered on as a three-piece. Their friendship with Jimi Hendrix led to a contract with The Experience's managers, former Animals bassist Chas Chandler and his partner, Mike Jeffrey, a shadowy American 'businessman' with reputed CIA and Mafia connections. In 1968 Soft Machine undertook a gruelling six-month (February to August) tour of the United States, supporting The Jimi Hendrix Experience. During the tour, over just three days out in New York in April, they recorded their debut album, produced by Tom Wilson (who had produced Simon & Garfunkel, Bob Dylan and Frank Zappa). Not surprisingly, they were unhappy with the results, but the album was surprisingly successful in America and led to demand for more touring, this time as headliners. Exhausted, Ayers quit after the U.S. tour and retreated to Majorca to write, then embarked on a solo career, although his former bandmates continued to contribute to his recordings, including Joy of a Toy, and he contiuned to work with Daevid Allen for some time. Ayers was replaced by Daevid and Wyatt's friend (and their former roadie) Hugh Hopper. Wyatt remained with the group for two more years but he began to lose interest in the direction they were taking and quit in late 1971 after their fourth album. Soft Machine continued with varying lineups, recording another three increasingly jazz-oriented studio LPs, before breaking up in late 1970s. Wyatt and David Sinclair then formed Matching Mole, who made two highly-regarded LPs. The new group harked back to the earlier song-based Soft Machine style -- its name was an anglicisation of the French translation of Soft Machine ("Machine Malle"). Another Antiopdean connection appeared in when David Sincliar was replaced by NZ-born pianist Dave Mcrae. Dave (who now lives in Sydney) is married to jazz singer and educator Joy Yates (their daughter is singer Jade Mcrae) and Dave spent many years in the UK, during time which he also worked with Bill Oddie on the music for The Goodies TV series. Matching Mole broke up briefly then reformed for a planned third LP, but in mid-1973, just before the album was due to be recorded, Wyatt he accidentally fell from an apartment window while attending a party, breaking his back, and he was rendered paraplegic. After several months' recovery, he returned to music, releasing a searing solo album Rock Bottom in late 1973; in 1974 he scored a surprise UK hit single with his idiosyncractic version of The Monkees' "I'm A Believer. He subsequently contributed to Albums by Hatfield & The North and Roxy Music's Phil Manzanera, among many other projects, and in the early '80s he enjoyed great critical and commercial success with his classic rendition of Elvis Costello's anti-war song "Shipbuilding". Meanwhile, back on Planet Gong, Daevid and Gilli Smyth initially retreated to Paris for some time, where they were apparently caught up in the famous student protests of May '68. They then headed to Majorca, where they became neighbours of renowned British poet and author Robert Graves (I, Claudius) and where Daevid hatched the plan for the "communal pan-European space rock band" Gong. After returning from Majorca, Daevid and Gilli made their new home at Deya, just outside Paris, where they hooked up with a floating community of like-minded musicians that included Christian Tritsch (bass) and Didier Malherbe (saxes, flute) and David began working under a variety of pseudonyms including "Dingo Virgin" and "Bert Camembert". During 1970 Daevid recorded two solo Albums for the French BYG label, Magick Brother, Mystic Sister and Banana Moon. The latter LP, which featured Robert Wyatt on drums, was re-released in the UK on Virgin's Caroline imprint in 1973 (its title is suspiciously similar to that of Kevin Ayers' 1973 solo album Bananmour. Daevid formed the first version of Gong with Smyth, Tritsch, Malherbe and drummer Pip Pyle (another Canterbury connection, later of Hatfield & The North). Pyle played only on the first Gong LP, Camembert Electrique and he quit during their first UK tour, although he features on a three-song John Peel Session taped by the BBC on 9 November 1971. This recording also includes Kevin Ayers, who performed with Gong during this formative stage but never joined permanently. Pip Pyle was replaced by British jazz drummer Laurie Allen (no relation), who played on the second Gong LP Continental Circus. Like Daevid's solo albums, the first two Gong albums were initially released in Europe only on the French BYG label but Camembert Electrique was reissued by Virgin/Caroline in the UK in 1973, by which time Gong were well-known, and the LP reportedly made the Top 5 in the UK album chart. Allen's output with Gong expressed his unique musical and spiritual interests, blending influences from electronic and avant-garde music, folk, psychedelia, rock, R&B and jazz, and many of the band's recordings and concert performances featured a substantial passages of free-form and improvised playing. Allen's trippy, whimsical songs formed an extended narrative detailing the exploits of a race of "pot-head pixies" from the utopian Planet Gong, who travelled in flying teapots. They were suffused with his mystical preoccupations (and his enthusiasm for mind-altering substances) but there was also a strong Absurdist element, inspired by his lifelong love of Spike Milligan. Gong's 'anything-can-happen' concerts and their outlandish stage presence made them a popular live attraction in France and they built up a solid cult following in the UK, thanks to the patronage of DJ John Peel, the former pirate radio DJ who became an fixture on BBC radio and whose hyper-catholic musical interests exerted a massive influence on the music scene. The first version of Gong broke up in early 1972, but the band reformed late in the year after they were offered a recording contract with Richard Branson's newly founded Virgin label. The new version of Gong comprised Daevid, Gilli, Laurie Allen and Didier Malherbe, with French bassist Francis Moze (ex Magma) replacing Tritsch, plus two new members, wiz-kid guitarist Steve Hillage and synth player Tim Blake. Over the next year the band recorded the three LPs that comprise Daevid's "Radio Gnome Invisible" trilogy. The first instalment, The Flying Teapot was recorded in early 1973. Daevid and Gilli headed off to Spain after the album was finished, so Hillage, Blake and Malherbe formed an interim band called "Paragong" with expatriate Aussie bassist Mike Howlett (ex-The Affair) and French drummer Pierre Moerlen, and they toured under that name until Daevid and Gilli returned. On 25 May 1973 the band recorded a second Peel Session, consisting of four pieces from the new LP. With the return of Daevid and Gilli, Paragong became the new incarnation of Gong and this lineup recorded Angel's Egg later in the year. To the consternation of the engineers, most of the tracks were taped out of doors in the woods around Daevid and Gilly's home outside Paris, capturing ambient forest sounds along with the music. The third instalment of the trilogy, You, was cut in early 1974 at Virgin's newly-completed Manor Studios in England. On 15 January 1974 Gong taped a third Peel Session but by this time the lineup had changed, with Di Bond replacing Gilli Smyth on vocals and Rob Tait on drums, replacing the temporarily departed Pierre Moerlen. Daevid left Gong for good in early 1974, a decision reportedly prompted by the infiltration of heroin and cocaine into the band's drug intake. He and Gilli headed off to Majorca once again to write, so Howlett and Moerlan took over the band, co-writing much of its subsequent material. The Howlett-Moerlen incarnation of Gong continued, with various lineups, until April 1977. Howlett had a brief collaboration with the future members of The Police ca. 1976 and went become a very successful producer in the early 1980s. In the decade after leaving Gong, Daevid recorded a series of solo Albums, most of which were only released in Europe, where he retained a solid following. The 1976 LP Good Morning! came out on Virgin and on this LP he was backed by the Spanish band Euterpe. It was followed by Now is the Happiest Time of Your life (Affinity, 1977), N'Existe Pas (Charly, 1979), Divided Alien Playbox '80 (Charly 1980), The Death of Rock'n'Roll and Other Entrances (Shanghai, 1982) and Alien In New York (Charly 1983). Although Daevid himself had much in common with the anarchic spirit of the time (and probably helped to inspire it), the rise of punk in Britain in the late '70s led to the repudiation of much the music and ethos of the late '60s and early '70s, and bands like Gong and Pink Floyd found themselves being was derided as "dinosaurs". This silly trend was exemplified by Johnny Rotten's infamous "I Hate Pink Floyd" t-shirt, but it was eagerly seized upon by the slavishly fashion-conscious British music press. In one unnerving incident, related in the Herald feature, Daevid was spotted in the audience of a Boomtown Rats concert in 1981 by the group's motor-mouthed lead singer Bob Geldof, who duly instructed the assembled fans to "kill the hippie" -- at which point the entire audience turned and stared at Daevid. This must have been unpleasant to say the least, but far more injurious in the long-term was a punitive contract Daevid signed ca. 1980 with notorious French music mogul Jean-Luc Young. Daevid recalled that he was suffering from a blinding sinus headache on the day he signed the contract and so he didn't read the fine print -- as a result, he unwittingly assigned all his publishing income to Young's Charly label. In spite of his sizeable back-catalogue, he now receives only a small income from his many recordings. Alongside his solo work, Daevid put together various later 'reincarnations' of Gong in the late Seventies and early Eighties. As 'Planet Gong' he recorded the single "Opium for the People" and the album Live Floating Anarchy 77, featuring tracks recorded on his Floating Anarchy tour and released in 1978. As 'New York Gong' (Allen plus the American band Material) he recorded another single, "Much Too Old" and an LP About Time (1980). Daevid returned to Australia in 1984, teaming up with musician David Tolley to form The Ex and recording the LP Don't Stop (Shanghai, 1986). This was followed by two Albums recorded under the delighful name "The Invisible Opera Company of Tibet" -- Oz Becoz (Invisible, 1988) and The Owl and the Tree (Demi Monde, 1989). During this period, living on the north coast of NSW, Allen maintained his interest in alternative, esoteric and wholistic matters, studying 'drone' music, training as an wholistic therapist and organising Healing Festivals. In the late Eighties, as the ecstasy-fuelled 'rave' scene gathered momentum in the UK and new musical styles like trance and acid-house emerged, previously reviled 'hippie' acts like Gong, Can and even Donovan were re-discovered by the new generation of music fans. By the early '90s Daevid found himself being cited as an influence by groups like 808 State and The Orb, and Gong classics such as "Thoughts For Naught" and "You Never Blow Y'r Trip Forever" were being remixed and given the "doof" treatment. Daevid returned to the UK and formed a new version of Gong called 'Gong Maison' (or 'Gongmaison'), undertaking occasional concert tours and recording several studio and live Albums including Gong Maison (1989), Shapeshifter, Live on TV 1990 (1993), 25th Birthday Party (Gong Live) (1995, culled from performances on the groyp's 25ht anniversary tour) and How to Nuke the Eiffel Tower (Gong Global Family) (1995). Daevid concurrently worked on several solo and collaborative projects including the Albums Australia Aquaria / She (Demi Monde, 1990), Stroking the Tail of the Bird (Amp, 1990) with Gilli Smyth and Harry Williamson, The Seven Drones (Voiceprint, 1991), Live at the Witchwood (Voiceprint, 1992, as Daevid Allen & The Magick Brothers), Invisible Opera Company of Tibet (Voiceprint, 1992), Twelve Selves (Voiceprint, 1993) and Voiceprint Radio Session (Voiceprint, 1994). Daevid and Gilli now divide their time between Europe and Australia, and when in Australia they spend most of their time in northern NSW around the 'hippie capitals' of Nimbin, Byron Bay and Mullumbimby. Much of the Gong back-catalogue has now been re-released on CD and in 2000 the band staged a 61-date tour of Europe. Daevid and Gilli are still both in demand at alternative festivals and art 'happenings' around the world. "People often ask me what I want, and the answer is: just a little bit less than I need. That's my philosophy of life. If I have more than I need, I get complacent. There's an idea prevalent these days that if you are an artist, you have to have a job in a supermarket or pumping petrol to get by. I totally and utterly reject that. I want to encourage people to give up their jobs and trust their art to brng them a way of life. I'm living proof that it's possible." For a complete Discography of the many singles, LPs, CDs and other recordings that Daevid Allen has released, or to which he has contributed, as well as the recordings by the various incarnations of Gong, please visit the Planet Gong website. "Aliens Made Me Do It"